Obsessed with the royals? Honestly, who isn't these days? Between the new baby, wedding planning, and the world's fascination with Prince George and Princess Charlotte, there's plenty of royal chatter infiltrating the internet, and without shame, we're here to add to it. One aspect of the royals, in particular, that we are so fascinated with is their jewelry. 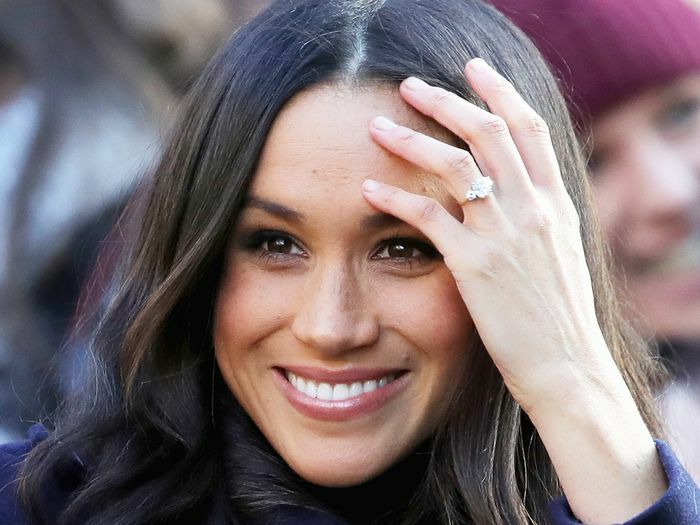 We gawked over Meghan's stunning three-stone engagement ring a while back, but we're finding ourselves looking to the next big thing—her wedding band. At this point, all we can do is daydream about the sparkling counterpart Meghan will slip on her finger come the wedding day, so in the meantime, we decided to reach out to Olivia Landau, private jeweler and founder of The Clear Cut, to have her grace us with her educated guesses on the matter. "When Prince Harry and Meghan Markle tie the knot, they will most likely stick to the 100-year-old tradition of using a Welsh gold wedding band. Queen Elizabeth was the first to wear a Welsh gold wedding band from the Clogau St. David's Mine. The mine is currently said to be 'exhausted', making this particular Welsh gold extremely rare and pricey. 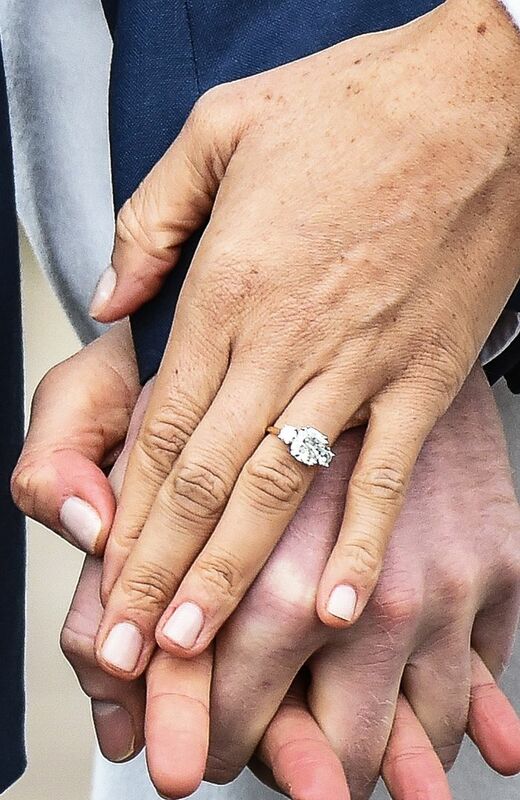 Although it is royal tradition to wed with a simple Welsh gold band, Kate Middleton pairs her Welsh gold band on one side of her sapphire engagement ring and on the other side wears an 18K white gold diamond pavé band. I like to think Meghan Markle will stick to tradition while also creating her own unique bridal stack. In addition to the Welsh gold band, there are some styles I think will pair well with her yellow gold three-stone engagement ring." You heard it here first—the three official guesses as to what this new royal family's wedding band will look like. Read up on Olivia's analysis of each wedding band option below and shop our favorite iterations of each. "You can't go wrong with a classic round brilliant eternity band. This is the perfect pop to a bridal stack. She can even wear it on her right hand for a subtler look. I love an eternity band because it is the perfect combination of classic elegance and undeniable bling. When opting for a round brilliant eternity band, I always suggest a common prong airline look. This lets the most amount of light in while also being a secure setting. Since she is an understated royal, I don't see her wearing a band with diamonds larger than .20ct each." "If Meghan decides to match her future sister-in-law, she could opt for a diamond pavé ring to add to her stack like Kate's. Since Meghan's engagement ring is yellow gold, I could see her having her Welsh gold band in yellow gold and a matching yellow gold pavé ring. The diamond pavé ring would add that little extra bling to her bridal stack." "Since Meghan's engagement ring mixes diamond cuts (her center stone is a cushion cut and her side stones are rounds), I could see a baguette diamond band as a great addition to her bridal stack. A baguette diamond band can be a modern accent to her more traditional engagement ring. A baguette diamond band gives that extra bit of bling you might be looking for with an elegant, unexpected twist." All styles mentioned can be custom designed by Olivia Landau at The Clear Cut. Speaking of Meghan Markle, check out the top four items everyone is buying just because she wore them.